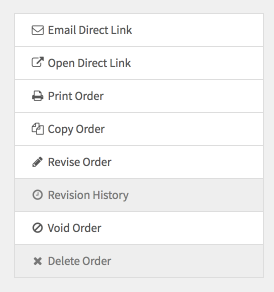 If you need to make adjustments to an order to add or remove products, adjust sales tax, etc., you can do so by selecting ‘Revise Order’ from the menu to the right of the order on the job's Quotes & Orders tab. Once you’ve adjusted it, you can then ‘Save & Book Revision’. Your invoice number will be revised to include ‘R1, R2, R3…’ depending on the number of revisions that are made. You then choose ‘View Revision History’ to see the different versions that exist.